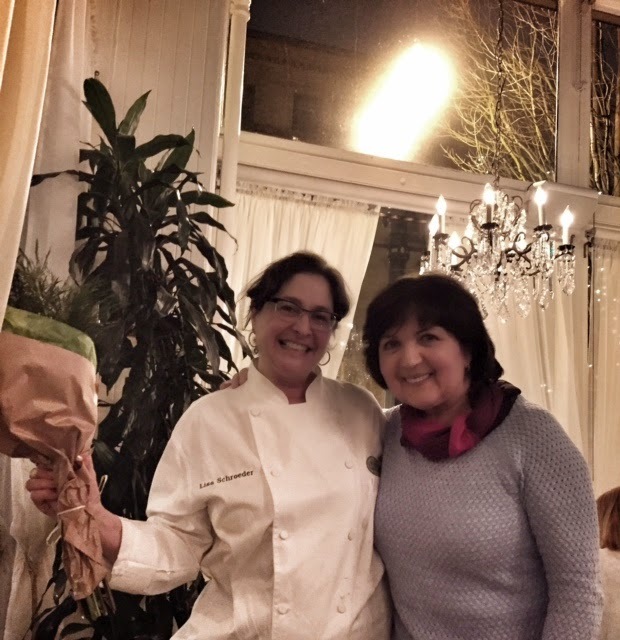 As I briefly mentioned on the blog a few weeks ago, my mom, Mira was graciously awarded the honor of being featured at Mother's Bistro & Bar in Portland with a special Slovak menu. Selecting a few dishes that represent our Eastern European heritage, my mom provided Mother's Owner & Executive Chef, Lisa Schroeder with the recipes that further got refined to fit the restaurant's clientele in Portland. Attending a celebratory dinner in my mom's honor this past weekend, we got to sample all her dishes, as served at the restaurant, and other delicious things that make Mother's so special. Warm, comfortable and delightful are words I'd use to describe the atmosphere at Mother's. From the beautiful lighting that comes in the form of vintage chandeliers to the paintings in gilded frames and the French country cupboards, you immediately feel at home even if this isn't the type of house you grew up in. Impressed by the sheer size of the restaurant that seemed to extend throughout an entire city block, we marveled at how busy it was - no doubt a great sign. Situated by a lovely rectangular table that was set for five, we took advantage of the comfy bench seating that gave my mom and I a great view of the entire restaurant. Even though I'll get to the details of the service a little later, it must be said that everyone at Mother's - from the hostess to the waiters all the way to the bus boys - exude warmth, friendliness and an overall happy disposition. Not only did this immediately make us feel comfortable, it's also a sign of a well run business. Segedinsky Gulas - While my mom usually prepares this dish with chunks of chicken, it's actually supposed to be cooked with pork, which is just what Chef Lisa did. Made up of shredded pieces of braised pork shoulder, the dish was also topped with delightful little egg noodles (that we call nokerle) which were slightly browned and therefore crunchy. Although different from my mom's dish, this really looked the part and tasted absolutely delicious. We couldn't get enough of the hearty gravy that surrounded all that tender meat and there was no doubt this dish was packed with love and flavor. Stuffed Cabbage Rolls - Loving the beautiful color on this dish, it was piled high with additional shredded cabbage, which is just how my mom prepares it. Once we let our forks pierce its soft shell, a tender beefy middle exposed itself, bejeweled with rice, making it that much heartier. A side of smashed potatoes was an alternative way to enjoy this meal but no doubt a tasty one. Slovak Apple Cake - Describing this as a "two crust flaky pastry filled with apples," we fell in love with it immediately. Reminding us more of my mom's zemlovka (Slovak bread pudding, also made with apples), we appreciated the healthy dose of shredded apples and the rich maple walnut ice cream that made it that much more luxurious. Pierogi - Along with the Segedinsky Gulas also came a portion of potato pierogi that were hard not to love. I think they were the perfect size too, as each piece provided about two good bites that we devoured with sauteed onions and silky sour cream on top. $15,000 Dungeness Crab Cakes - Dan couldn't resist ordering this decadent dish made of fresh local crab, seasoned with creole mustard sauce, coleslaw and matchstick potatoes piled way high. I had a generous piece of the crab cake and was impressed by its creamy consistency and perfectly crunchy crust. Truly receiving A-list treatment, we couldn't have asked for a better evening. Not only were we treated like special VIP guests, my Mom was given the well deserved kudos by both staff and customers, which made her day and melted my heart. Chef Lisa and her whole staff were beyond lovely, generous and welcoming and we treasured just how seriously they take their Mother of Month program. It rightfully exemplified a business that not only sticks to its mission but carries it out with pride and dignity. Since we were the guests of honor that night, our meal was graciously comped but here's an idea of the prices you can expect. They're very reasonable!